Pewter, an alloy of tin and lead, used to bring to mind matte, anthracite-grey mugs, flasks, and tableware susceptible to serving up lead poisoning, in addition to whatever else the kitchen had to offer. In other words, anything but this lozenge-shaped, organic biscuit box, marked “KAYSERZINN”. This perception was changed when Engelbert Kayser created “KAYSERZINN” in or about 1894. Producing functional yet decorative pewter in Düsseldorf, Germany, and later in Cologne, Engelbert revolutionized pewter into not only an acceptable material for decorative tableware, but a desirable one. The pewter Engelbert used was composed of 93% tin, 5.4% antimony, and 1.6 % copper; the material was lead-free (and therefore food-safe), ductile, of a color compatible with silver, and had no tendency to oxidize. 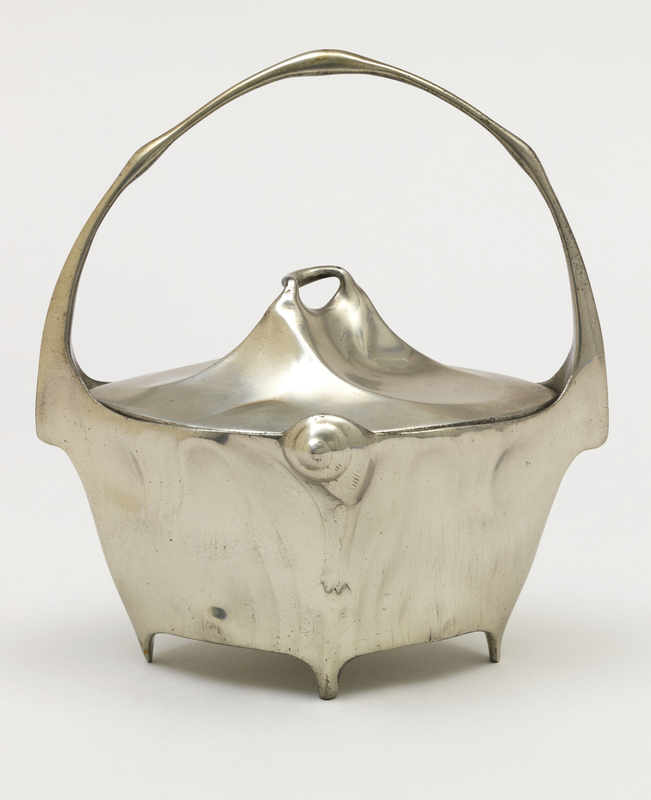 Furthermore, pewter did not carry the elitist and conservative design values of silver—a benefit at the turbulent end of the nineteenth century. KAYSERZINN could be marketed as functional tableware, aesthetically pleasing, cost-efficient and, therefore, accessible to a growing middle-class. Engelbert retained the services of sculptor Hugo Leven, who would go on to be the most important designer for the firm. Leven developed a technique called “thumb-pressure relief” to create forms in clay or wax, which would then be used to create iron molds from which the pewter could be cast on an industrial scale. Unlike many art nouveau artists, who focused on surface decoration and representation of nature, Leven worked in a style called Jugendstil (literally, “style of youth”), and favored designs that were very three-dimensional and closer to sculpture, largely devoid of surface decoration, and non-representational. Leven’s style is exemplified in this biscuit box, on which the “thumb-print” relief can readily be observed, as can a three-dimensional snail, which appears to be melting from the cover. The functional, yet wonderfully abstract form of the box, in many ways foreshadows German expressionism. Catherine Powell is a candidate in the M.A. History of Design and Curatorial Studies program offered jointly by the Parsons School of Design and the Cooper Hewitt, Smithsonian Design Museum. She is a Fellow in the Product Design and Decorative Arts Department of the Museum. Kayserzinn Biscuit Box. Manufactured by J. P. Kayser & Sohn (Krefeld, Germany, ca. 1902–04. Cast pewter. Gift of Gerald G. Stiebel and Penelope Hunter-Stiebel. 2013-49-9-a,b.